Kate has returned to her home in Australia after being away for 5 years. She’s back here in 4 months time though to race in the UK and perhaps a couple of the European World Cup events. 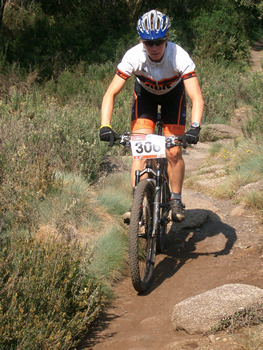 Kate also runs AQR in the Pyrenees with her husband Ian and if you’re a regular reader of the TORQ news pages, you’ll recognise them as the French holiday company we use for our Fitness Weeks. So Kate’s national identity is a little up in the air at the moment. I’m sure if you asked her, she’d say she was Australian, but then she does use words like ‘lovely’ and ‘cheerio’, which are definitely ‘our’ words. She and her husband own their only house in France and spend over 6 months of the year there, so I guess the French can lay claim to her too. Whoever she is, she’s riding her Mountain Bike fast at the moment. Kate has completed 2 rounds of the Australian NPS, finishing in 2nd place in Round 1 – 5 seconds off the winner. Then in Round 2, she won it with a 2-minute lead and the fastest lap of the race. Not just the fastest lap of the race, but it was her last lap! If you read on to learn about Kate’s account of the races, you’ll note that neither race went smoothly for her. I wonder what she’ll do if everything goes to plan? While it may seem a bit odd for an Australian to be sending a race report to the UK, I can’t help but think of the UK as one of my homes.  I learnt to ride a mountain bike in the UK and have formed a close network of friends, family and industry sponsors who have all supported me in my quest to become an elite mountain bike racer. 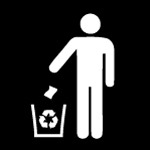 I may never be eligible to contest the British national championships because I’m aussie born and bred. However I would love to be selected for the Australian team to wear green and gold, and race on my adopted home turf in the UK (Fort William) next year. But before I even contemplate the World championships in 2007, I must return home and race the Australian national cross country series. Spending winter in Oz where the temperature remains on average 30 degrees Celsius was too good an opportunity to miss to test out my new Cotic Soda race bike. Plus I can also practice my bunny hopping technique as I’m sure there will be more than one croc to dodge out here in the Aussie jungle. Team Cotic/AQR consists of myself and my husband Ian, and we flew into Hobart, Tasmania two days before the race. 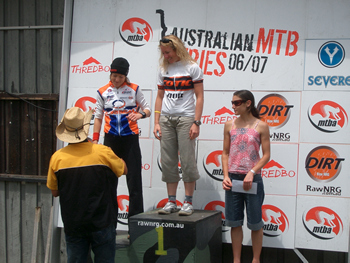 The event was being held under Mount Wellington at the Glenorchy Mountain Bike Park. The venue caters for XC, down hill and mountain cross. The cross country course was brilliant! 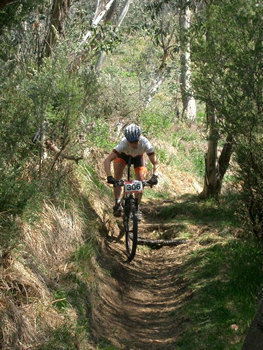 A testing circuit, very technical in places, it was also a fast course with plenty of single track. There were super fast straights that lead into tight switchbacks, rocks and roots to hop over and best of all, jumps and drop offs to really test your bottle. I love climbing, especially technical climbs, and this course had plenty of short steep sections to keep you breathing hard. My only reservation was how to ride and survive the dust! I have never experienced dust like this before. If you were too close to a rider in front, then you would not only be blinded, but suffocate from the dusty fumes. The first opportunity to run my Soda off road was during the practice lap the day before my first race. There were a few teething problems that were only to be expected as Ian only had a short time to set the bike up before it was sent to Australia. Matt Hart from TORQ Fitness is my coach, and between us we had decided before I left the UK that this race would be a training exercise and good experience as I had only been back training properly for a couple of weeks. I felt no pressure, and simply wanted to learn from the experience and make the most of racing this brilliant course in Australian made sunshine. However where the Potters go usually means rain is never too far away. Australia has been in drought for a long time, but as soon as we touched down the rain clouds appeared. Race morning was cool and breezy, and as expected the rain clouds lingered close by and for a short while it started raining. Fortunately everybody hoped for a touch of rain to damp down the choking dust. I was looking forward to the race the day before, but on Saturday morning a strange sensation of nerves passed through me. Memories of my first mountain bike race came flooding back as I waited anxiously for the women’s elite field to be called to the start line. I was experiencing ‘déjà vu’, as I thought about my first race in the UK in 2004, except this time there were gum trees that marked the start of the course and noisy kookaburras peering down on all the colourful creatures in lycra. I even caught sight of a wallaby engrossed in the action as all these ladies aboard mountain bikes gathered round in the pit area ready to be called to the start line. Butterflies – or perhaps I should say mozzies – were buzzing in the pit of my stomach. There were more girls than I expected lining up, including race favourites Emma Coulson who represented Australia at both the Commonwealth Games and the World Championships, and Tory Thomas who was recently crowned the National Marathon Champion. I missed the first round of the series so I was the last rider called to line up. There was a wide choice of positions at the back of the pack. I was number 21, and all the girls in front of me were in rows of five. So without any elbows to look out for I made my way to the middle of the back row, with only me to avoid knocking into, or so I thought. I knew I had to have a good start if I wanted to be competitive, as it was virtually impossible to over take on the single track. When the bell sounded I was off, literally, as a girl had fallen in front of me and I was lucky not to be kissing the ground as well. 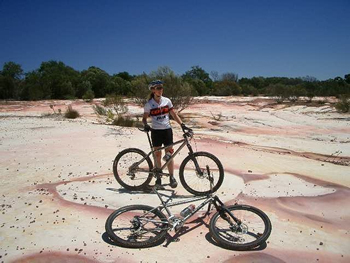 I quickly jumped on my bike as I saw the tailing riders disappear through the gum trees. As I landed back on the saddle – ever so gracefully I might add – the nose of my saddle moved (and no it wasn’t because I have been eating too many pies). I was forced to stand up most of the way around the course or sit right at the back end of the saddle on the steeper sections. There was no point stopping as I had lost loads of time already. I managed to catch a few girls towards the end of the first lap. I remained calm all the way, even when another new bike gremlin hit and my front mech decided that it didn’t like moving too much and stopped me from changing gears quickly when I really needed my granny. By the second lap I caught sight of girls going through the starting arena, who I thought were the race leaders. When I passed Ian he told me I was 50 seconds behind, which I presumed was from the rider in front of me. At the start of the final lap the commentator announced that I was currently in third position and only 30 seconds behind the race leader Tory Thomas. I was surprised, but kept riding hard as I caught sight of Tory starting the final climb. I knew I had to be in front of Tory going into the last descent, as it turned to tight single track where overtaking was restricted. I tried three times on the last climb to take a tight switchback line to take the lead, but Tory held her position confidently and I remained buzzing on her back wheel. As we reached the bottom of the final descent I was still riding comfortably on her back wheel, but as I tried again to overtake over some off camber roots, I took a bad line and lost valuable seconds. Tory rode hard and smoothly all the way across the finish line in a time of 1:30:01 and I finished in second place, five seconds behind. Tory was very deserving of her win, and I was thrilled to have finished second behind her. It wasn’t one of my best races, I made mistakes and had a bit of bad luck, but that’s racing. I have plenty to work on over the next few weeks, but loved every moment of my first Australian cross country race and can’t wait for the next event in Thredbo on December 17th. 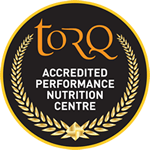 I am fuelled by TORQ energy products and trained by Matt Hart (TORQ Fitness). TORQ Ribose, TORQ HMB & TORQ Glutamine. I train using Cycleops’ Powertap System and turbo trainer.